Recently, I wrote about the ways “It’s not that bad” has kept me from owning and validating the true cost of my traumatic past. There have been times I have envied those with physical trauma because they received all the validation and support that was denied me as a survivor of psychological trauma. There are plenty of abuse survivors with far more dramatic stories than mine. Surely, we’ve all been in situations where someone else’s story of calamity and misfortune has humbled us. Ironically, for many, holding on to the misplaced shame that their own story of abuse isn’t “good enough” to be validated because more terrible things have happened to others is exactly the trap that keeps us silent and perpetuates the cycle. Acknowledging trauma is about acknowledging one’s own perception. It’s not something someone else can determine or validate for you. The greatest goal for an abuse survivor is to be able to own what actually happened to them. Not someone else’s whitewashed version, not some minimized, easy to swallow version, but to actually feel and acknowledge the depth of their own pain without any other qualification. In hospitals, nurses are trained to administer medication based on the patient’s perception of pain. 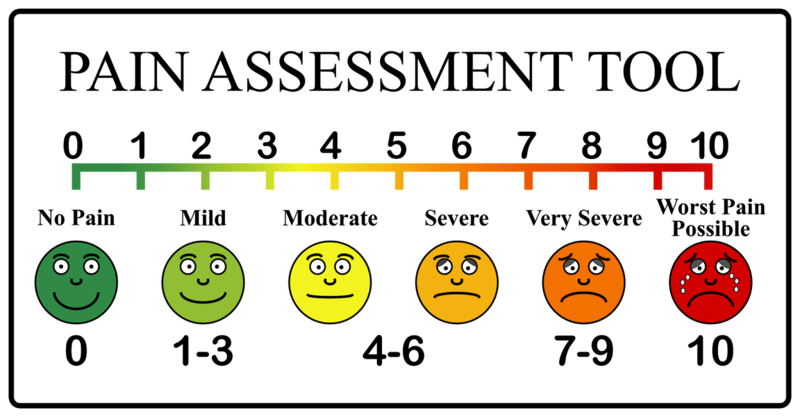 Patients point to a scale of one to ten with happy faces for no pain to frowny faces for the worst pain of their life. It’s a simple yet effective measure. There is no other effective way to measure the effect of pain in someone’s body. Yet, if you show the scale to survivors of emotional trauma, many point to the smiley faces when what they are actually feeling is quite frowny. They do this out of habit. They do this sometimes because they are afraid to be perceived as weak. They do this because sometimes they are so dissociated, they really can’t feel anything any more. Because I lived with “it’s not that bad” for so long, and absorbed the shame of thinking I didn’t have a spectacular “story” to put to what happened, I spent many years feeling like a loser for having any bad feelings at all about my abusers. I was stuck in the cycle of shame-based abuse that keeps victims silent, often for their entire lives. Little by little, over time, I realized though, that it was actually that bad. Because of the complex, every day nature of the psychological, narcissistic manipulation and gaslighting I endured, what felt “normal” to me was anything but normal. Growing up in a family where I wasn’t allowed to have any sense of self is not normal. And, in fact, I do have some pretty extreme, dramatic, Lifetime Movie quality stories. They had just been so stuffed down and minimized that my perception of their severity was skewed. Many survivors are frozen into thinking “it’s not that bad” because it’s too painful for them to accept that it really was that bad. That’s the nature of trauma. Our brains, in an effort to protect us, shut down and shield us from the truth. True healing is all about unlocking the brain to feel and acknowledge what actually happened, and how it actually felt to us, for the sake of releasing the stored memory from our physical bodies. When you’ve been frozen for a long time, guess what? Thawing out hurts. Not only is the original wound still there, but also all the years of overcompensating, clenching, and tension from holding a lifetime’s worth of defensive posturing. Our bodies become so tightly wound over time that it is a miracle in itself that anyone can unravel after that. Sometimes, breakthroughs look like breakdowns. Being able to finally point to the red, frowny- face “10” is a horrible revelation, but it is exactly what is needed in order to receive necessary healing and relief. Recovery is a paradox. It is ugly and beautiful. It is terrible and wonderful. It often feels more painful than staying stuck. But bodies and brains are resilient if we give them a chance.